MXC earns 3rd at NCAA National Championships!!! Congratulations to Rob Conner and the Pilots! More information to follow! Re: MXC earns 3rd at NCAA National Championships!!! Tansey Lystad finishes 15th at #NCAA Cross Country Championships!!! Best women's individual finish in program history!!! Wonderful to see Tansey on the podium recognized among the Top-15 in the NCAA D-1 X-C Women's Championships....from UP!! Two Pilots are All-America, Scott Fauble, and on crutches, Reid Buchanan. Wow! Terrific leap forward for the program and for Rob. Great performance by all the runners. Congrats to Tansey, Scott, and Reid on earning the All America slots also. The Pilots are one of only four teams in the country to finish in the top 14 at the NCAA's for eight consecutive years, joining Northern Arizona, Wisconsin and Oklahoma State. Portland's previous best finish was seventh, which happened in 2001, 2008 and 2013. 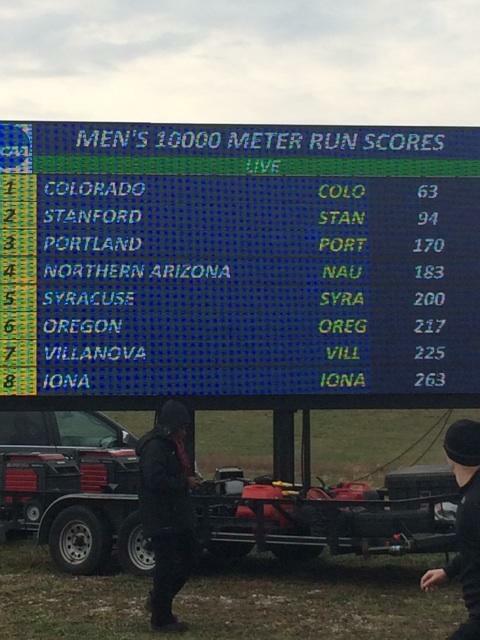 Oregon was well back of the Pilots in sixth place. And what happened to BYU? Their top finisher was 67, behind four UP runners. That is HUGE. Passing that many guys with only 1k to go is impressive. Great performance for the program. I was hoping for top 5, this is much better! Great coverage by the O on the Cross country championships. 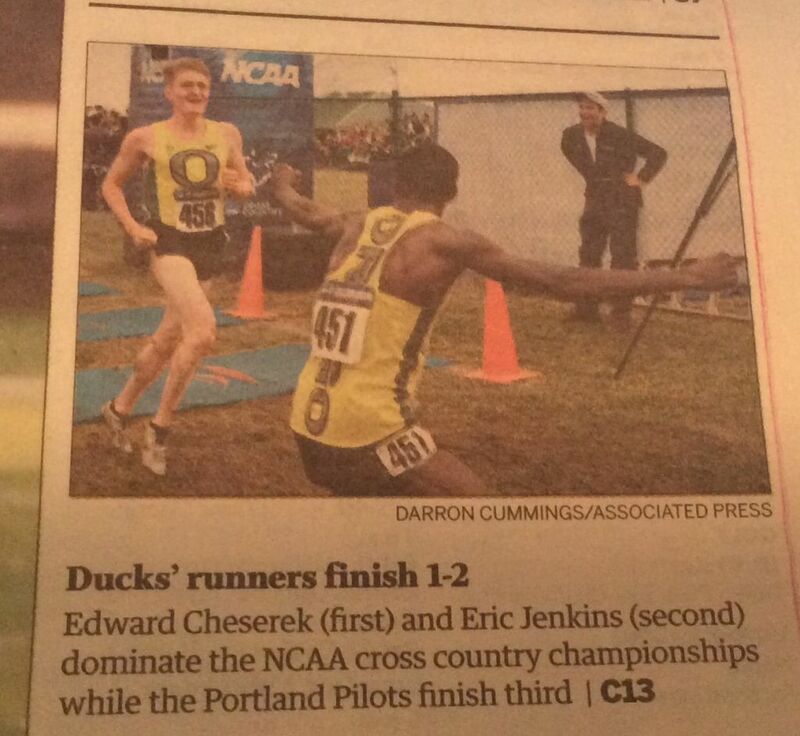 So.. By that article Oregon Universities got a clean sweep at Nationals. No mention that UP's third place finish put them on the podium while the Ducks team placed sixth and watched the medals ceremony from the stands. Geezaldinho wrote: Great coverage by the O on the Cross country championships. Wow. That caption is pretty bad. It easily confuses the individual places with team results. There will be a celebration for the XC teams tomorrow (Tuesday) at 3:30 in the Chiles Plaza, if anyone happens to be around. The team will also be recognized at the Oregon State basketball game... something tells me if the announcer mentions that we beat the Ducks, EVERYONE in the crowd will be thrilled. Stonehouse wrote: The team will also be recognized at the Oregon State basketball game... something tells me if the announcer mentions that we beat the Ducks, EVERYONE in the crowd will be thrilled. During the Ducks' football game against Colorado last weekend I heard the PA announcer in background talking about the XC results. I wonder if he mentioned Colorado won the team title and the Pilots were the best team from Oregon.